Club USA in Littleton features a 17-meter indoor pool that accommodates swim lessons, water aerobics classes, lap swimming and open swimming with your children. In the pool area, we also have an adult hot tub, a family hot tub with a lower water temperature, a co-ed sauna, and co-ed steam room. The spa area is a great way to relax at the end of your workout or to indulge in the executive workout. The CDC reports on the health benefits of Water-Based Exercises like our water aerobics classes. Swimming is the second most popular sports activity in the United States and a good way to get regular aerobic physical activity. Just two and a half hours per week of aerobic physical activity, such as swimming, bicycling, or running can decrease the risk of chronic illnesses. This can also lead to improved health for people with diabetes and heart disease. Swimming not your fav? Try our aquafit classes. Get out of the studio & into the pool for this non-stop, total body workout that uses the resistance of the water to improve cardiovascular stamina and muscular endurance. You get a complete cardio and conditioning workout in our aquafit classes at our pool in Littleton without the impact or stress on the body! 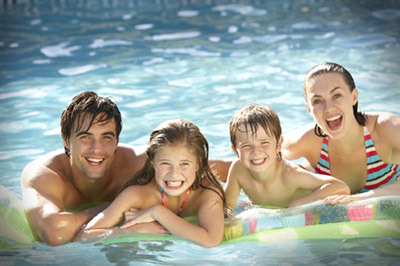 To find out more about our swimming lessons and aquafit classes, contact us at membership@clubusa.net. Exercising in water makes you feel about 90 percent lighter, reports the American Council on Exercise. When you jump or run in the water, your body does not experience the same impact that these moves cause on land. This makes water aerobics classes an ideal activity for those with arthritis, back problems, foot or leg injuries, and knee conditions. Pregnant women and obese also benefit from the reduced impact. Expect to burn between 400 and 500 calories per hour in one of our water aerobics classes, according to the Aquatic Exercise Association. The actual amount you burn will depend on your size, the intensity of your movements, as well as water temperature and depth. In general, faster movements incorporating the upper and lower body in deep water elicit the greatest calorie burn. When exercising in water, you work against 12 times the resistance of air, according to an article published in “American Fitness” in 1996. Simply kicking and cupping the water helps contribute to muscle development, which translates into a higher metabolism and healthier body. Many water aerobics classes incorporate equipment like water paddles, noodles, single or double buoys, and kickboards to further induce strength gains. Push-ups or triceps dips performed on the pool deck also help build strength. So, whether you want to just relax or exercise, Club USA’s aquatic area in Littleton offers fun and activities for everyone.